As seen on BBC's 'Escape to the Country', this handsome barn conversion, with self-contained one bedroom annexe, ample parking and boat storage, is set in pretty gardens and backs onto open countryside. Additional land is also available by separate negotiation. The Barn, Old Cotmore Farm is situated in one of the finest spots in The South Hams, providing easy access to the coast approximately 1 mile from the sea at Beesands and enjoying delightful country views. With one of the highest rated primary schools just up the road at Stokenham, this would make a great permanent home, with the ability to use the annexe for either visiting guests/dependent relatives, or for creating an income stream from renters (holiday or long term). The property would also lend itself to a fabulous holiday home, being located so close to the sea. 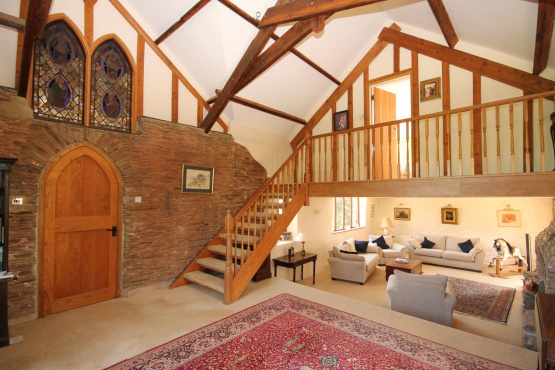 The Barn, Old Cotmore Farm invites offers in excess of £600,000. For further information please contact Marchand Petit’s Kingsbridge office on 01548 857588.